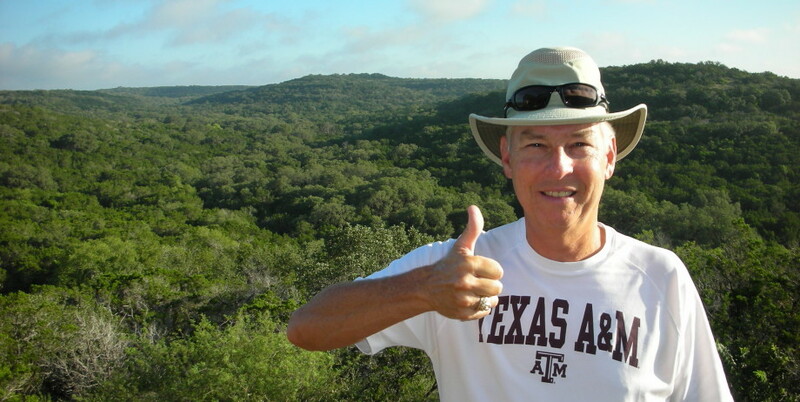 I’m John Ball, Texas A&M class of ‘78 from San Antonio, Texas. I was born in Paris, Texas on 8 September, 1956, to John D. (Shorty) Ball and Ruth Hulsey Ball. I grew up on a farm near Paris and attended Deport and Prairiland schools, graduating in 1974. My former teachers would tell you I was a pretty average kid; plenty of potential but not enough follow-through. I spent a lot of time playing every sport but didn’t take academics very seriously at the time. In the summer of 1976, I married my high school sweetheart, Wyn Dunn, daughter of Bobby and Donna Dunn. We moved to College Station; I to attend Texas A&M, and Wyn to finish high school at A&M Consolidated. I quickly discovered if you don’t study, you don’t graduate. So with Wyn pushing me, I studied and received my degree from Texas A&M in May 1978. After a short time in Houston, we moved back to our hometown of Paris where I had a couple of jobs over the next two years, but none of them really motivated me. Then in the spring of 1980, I applied for and was selected to attend U.S. Air Force Officer’s Training School and Undergraduate Pilot Training. It’s at this point in the story that my son-in-law Kyle Meredith likes to say I “fell off the back of a tractor and landed in the Air Force.” Suffice to say, I found my niche. There is really nothing as motivating as finding a career doing something that is really fun, exciting and just cool to do. Flying jets in the Air Force was all of that and so much more. I had never been around airplanes before the Air Force; I had never even bought a ticket and ridden on an airplane. But words cannot begin to tell how great it is to be able to do something for an entire career that you like to do. Between June 1980 and August 2006, God blessed me with a most rewarding 26 year Air Force career. During that period, I logged over 5000 hours of flight time, visited 76 foreign countries and never once regretted the decision of becoming an Air Force officer. I flew in every major contingency operation during those years, including Grenada, Panama, Bosnia, Desert Shield/Storm, Afghanistan and Iraq. I spent a year with the Army at Ft. Leavenworth, Kansas attending Command and General Staff College and received two Master’s Degrees, one from the University of Oklahoma and another from The Air War College. A highlight of my flying career was serving two years as an Air Force 2 pilot for Vice President’s Gore and Chaney. I commanded two squadrons and two operations groups and retired as the Dean of Students of the Air War College in Montgomery, Alabama in the rank of Colonel. After retiring from the Air Force in 2006, I started a second career in San Antonio training Air Force pilots to fly the C-5 aircraft; the same airplane I had spent most of my career flying. 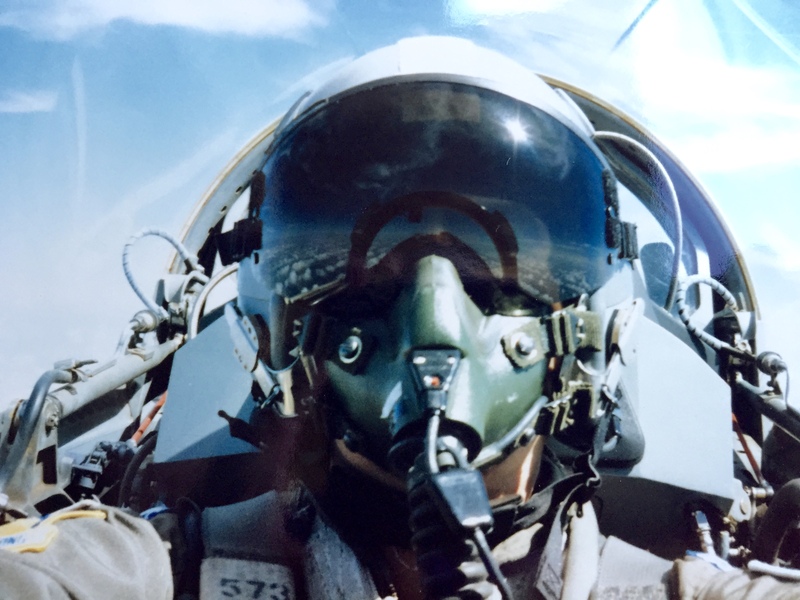 This second career serving as a Pilot Instructor for FlightSafety Services Corporation and as a Manager for Lockheed Martin lasted 8+ very rewarding years. During our two careers, Wyn and I raised two beautiful daughters, Jessie (TAMU ’05), and Karla (TAMU-San Antonio ’12). Seeing the two of them grow up to be mature, productive adults and have families of their own is the absolute greatest accomplishment of our lives, bar none. After retiring from my second career in 2015, I went on a 2686 mile, 170 day coast-to-coast walk across America. Though I had never been a big backpacker or hiker, I went into that adventure with a healthy awareness and respect for the challenges I faced, both physical and mental. As far as the physical challenge, I had prepared for the walk for several years. I was always physically active while in the Air Force, with running being my primary choice of exercise. However, as I grew older, and around the time of my retirement from the Air Force, my knees began to show the inevitable wear and tear that running brings. The doctor told me I needed to stop pounding the pavement like I was doing, so I turned to walking long distances instead. In the 8 years leading up to my 2015 walk across America, I walked over 16,000 miles, never once walking less than 2,000 miles per year. I routinely walked over 30 consecutive days without a break, covering 6-10 miles on an average day, and quite often walked 15-20 miles per day on weekends. The most I walked in one day was 30 miles. So from a physical perspective, I was ready for the challenge. The significant challenge of hiking long distances lied in the mental, and this belief was consistent with the experiences of others who had thru- hiked from coast-to-coast before me. Being on the road for almost six months, with its associated isolation, boredom and the uncertainty of where you will sleep on a given night, eat your next meal, or find your next gallon of drinking water can take a toll on you mentally. However, I had developed a solid hiking plan that helped alleviate much of the uncertainty of that trip. 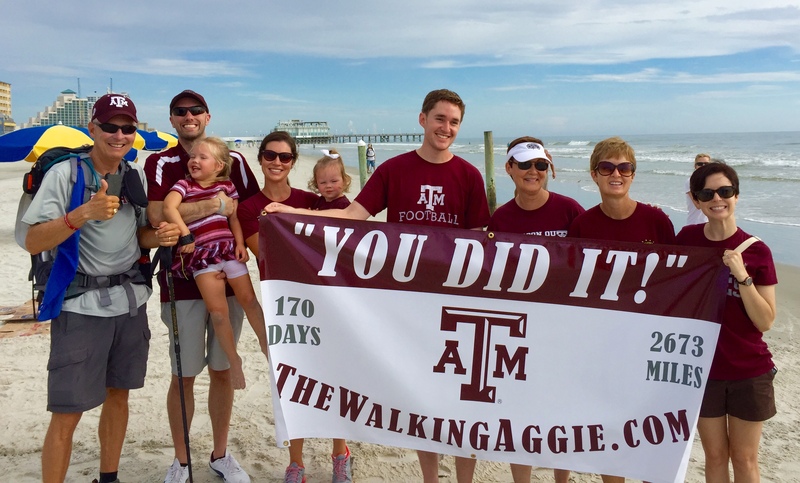 In addition, the motivation of raising funds for The Walking Aggie Endowed Ring Scholarship helped with the mental challenges I faced. Finally, with the full support of my family and friends, and hundreds of amazingly nice people along my route, I successfully dealt with the mental aspects of that effort as well. Now I will set out on another walking adventure; this time 2321 miles across the entire European continent. From Athens, Greece to Oslo, Norway, we’ll walk through 7 countries in 150 days. I can only hope this walk will be as rewarding as the first. So that’s who I am. 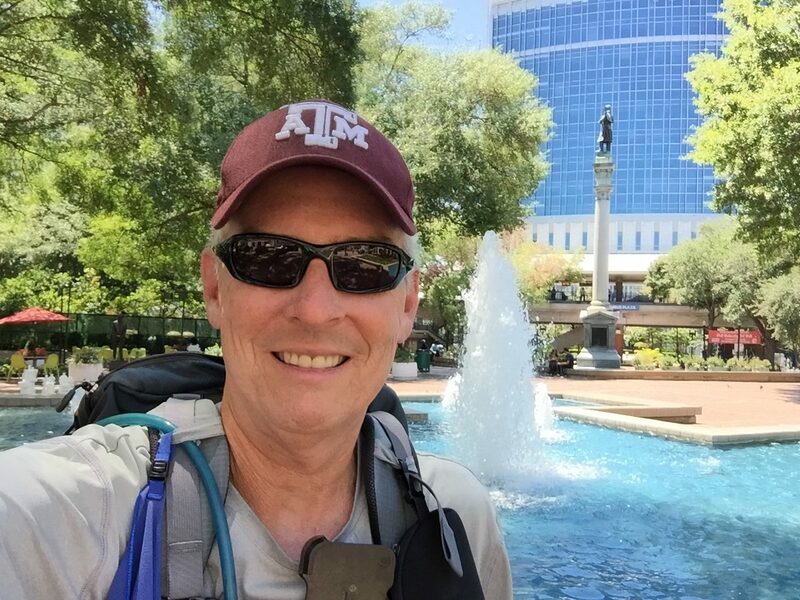 Small town Texas kid who got lucky enough to find something he really liked to do in the Air Force; a retiree with a second career in aviation; a grandfather; an avid walker with a passion of backpacking long distances; and a supporter of any and all things that have to do with Texas A&M. I would be honored if you would join us online as we set out on this adventure.